Take all the fun, thrills and fabulous payouts of the popular Break da Bank Again slots game, multiply the action by 4 and you’ve got Microgaming’s latest version, MegaSpin Break da Bank Again Video Slot. Quadruple your gaming enjoyment on four 5 reel, 9 payline games and you could win up to 25 Free Spins per game, that’s up to 100 Free Spins in total if you find 3 or more Scatter Vault symbols. Plus, keep an eye out for the Break da Bank Again logo which will multiply your Wilds by 5. And that’s just a few of the many golden winning opportunities waiting to be unlocked. 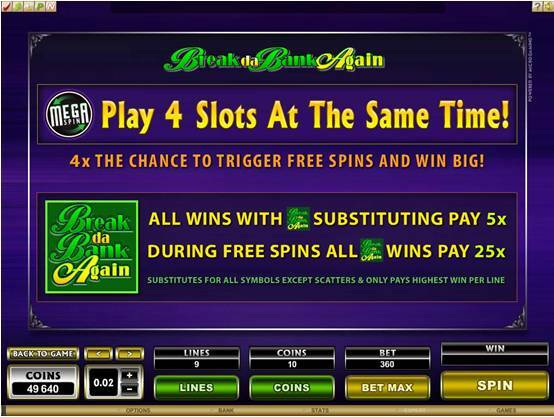 The title of River Belle Casino's newest game will evoke warm memories for many players who enjoyed the popular original version; MEGASPIN BREAK DA BANK AGAIN is an up-to-the-minute version 4 Slots in one game, whilst retaining the assets-oriented theme and slick action of its predecessor. This 5-reeler multi-slot now offers nine pay-lines each on four slots-within-a-slot and delivers four times the action, presenting players with a richly themed combination of, Scatters and generous Free Spins with significant Multipliers. Online gamblers will instantly recognize the up-market graphics of gold and silver ingots, coins, cheque books, banknotes and gems. Every time the Scatter appears there's the prospect of reward; 3, 4 or 5 awards the player with between 15 and 25 Free Spins with 5x multipliers attached, and for each additional vault that lands within Free Spins an additional free spin is awarded. 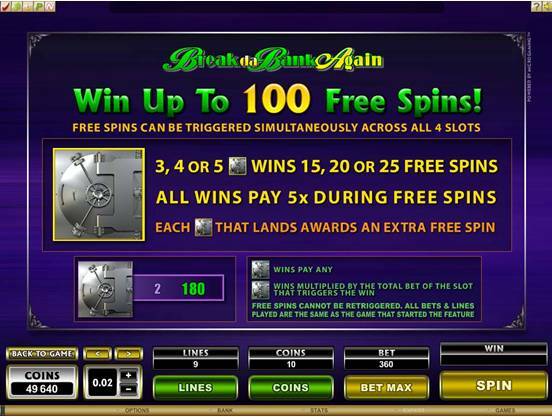 In this amped-up version players can win up to 100 Free Spins, adding a new dimension to a game that has already won a reputation for outstanding entertainment value. 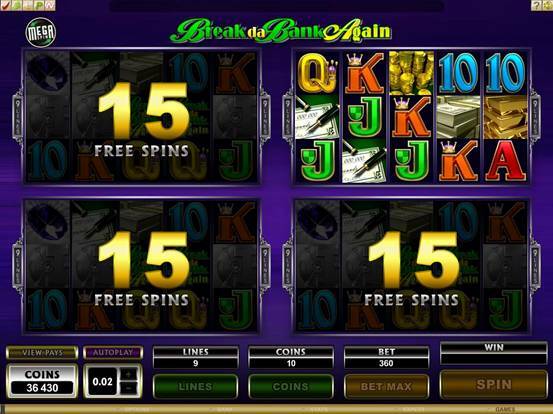 The “Break da Bank Again” logo is also good news; the player's Wilds are multiplied by 5x when it lands, and if appearing during the Free Spins feature that already generous multiplier soars to 25x. This is a Video Slot that actually consists of four individual slots, each of nine lines, enabling the player to win Free Spins on multiple slots simultaneously and reap some serious rewards...up to almost 100 000.00 on maximum bets and with good fortune. The many players who found the first Break Da Bank entertaining will find this new, up gunned version even more exciting to play. Here at River Belle Casino this enhanced version of an old favourite is going to be a major hit. Gaming Club Casino Play MegaSpin Break da Bank Again video slot and get 30 Free slot machine spins. Gaming Club Online Casino also offers amazing online casino promotions that give players the chance to win anything from VIP Cruises, Roadster Sports Cars, Custom Built Motorbikes to Millions of $’s in Cash and Casino Credits! Golden Tiger Casino Play Break da Bank Again slot machine with $1,500 totally free and whatever you win in your first 60 minutes is yours to keep! Play at Golden Tiger Casino with NO RISK to your personal funds!. 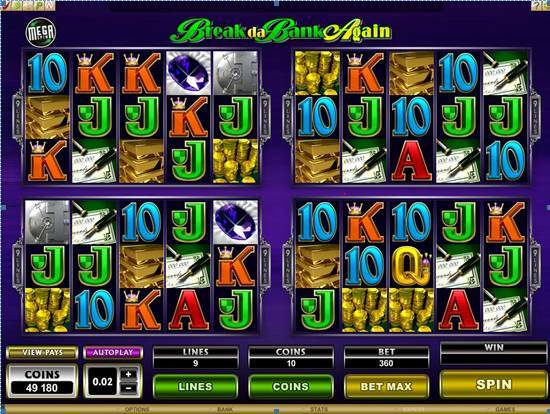 Jackpot City Casino Enjoy new video slot game - MegaSpin Break da Bank Again. 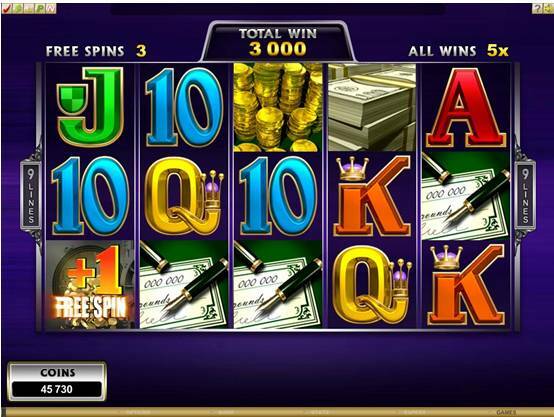 Play over 400 games and get $500 Free to win Huge Jackpots! Start spinning the reels to make your dreams come true!